An original letter of correspondence between brothers and business partners Joshua Coffin Chase and Sydney Octavius Chase. Topics discussed in the letter include A. Q. Lancaster's block contract to clean newly purchased land at Isleworth Grove, management plans for the acreage in case of decreased prices or a damaging freeze, and resuming operations on oranges. Original letter from Letter from Joshua Coffin Chase to Sydney Octavius Chase, December 22, 1913: box 49, folder 20.84, Chase Collection (MS 14), Special and Area Studies Collections, George A. Smathers Libraries, University of Florida, Gainesville, Florida. 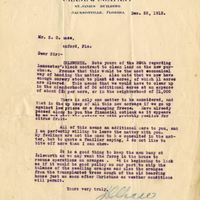 Digital reproduction of original letter from Letter from Joshua Coffin Chase to Sydney Octavius Chase, December 22, 1913. "Joshua Coffin Chase (1858-1948)." Florida Citrus Hall of Fame. Copyright 2012. There is only one matter to be considered, and that is the up keep of all this new acreage if we go up against low prices or a damaging freeze. Have already passed along to you the financial outlook as it appears to me and also the [?] we will probably realize for citrus fruit. All of this means an additional care to you, and I am perfectly willing to leave the matter with you. My feelings are not the ones to b e consulted in the matter, but to quote a familiar saying, I do not like to bite off more than I can chew. It is a good thing to keep the men busy at Isleworth as we may want the force in the house to resume operations on oranges. It is beginning to look as if it would be good policy on our part to ship the balance of the seedling oranges and also the oranges from the transplanted trees sough of the old boarding house just as soon after Christmas as weather conditions will permit. Chase, Joshua Coffin. 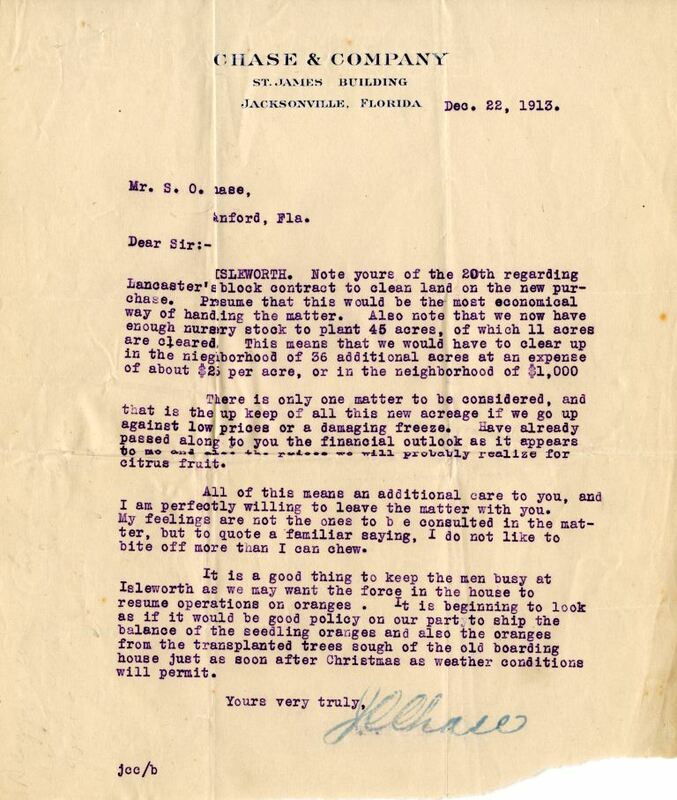 “Letter from Letter from Joshua Coffin Chase to Sydney Octavius Chase (December 22, 1913).” RICHES of Central Florida accessed April 19, 2019, https://richesmi.cah.ucf.edu/omeka/items/show/2709.